magnificent panoramic views. Click HERE to see more photos. Pilings (also referred to as stilts or piers) may be the perfect solution for building or rebuilding after hurricanes like Irma and Harvey near the coast and in flood plains. Their flexibility in height also makes them ideal for uneven terrain or where elevation is desired to enhance views of the natural surroundings. In some locations building codes will specify the height and type of piling or stilt foundations. This is especially true in hurricane and severe weather zones like Florida and its Keys, the Gulf Coast to Texas, the Carolinas, New York and New Jersey, as well as in places like California and Hawaii, where sloping terrain, seismic activity and land slides must also be taken into account. Any of Topsider’s Premiere and Classic luxury home designs can be elevated on pilings or piers like this beautiful South Carolina coastal home. Click HERE to see more photos. Two-story elevated piling and stilt houses like this are ideal for coastal hurricane prone areas from the New Jersey shore to the Florida Keys. Click HERE to see more photos. Piling and stilt home heights typically range from a few feet above ground to as much as 10 to 20 feet or more in coastal, hurricane and flood plain areas. 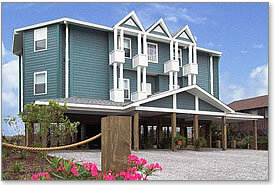 Some Topsider stilt houses have been designed on steel pilings that are more than 25 feet tall. Pilings may be constructed of wood, concrete, steel or even composite materials. And they are usually driven, augured or jetted into place. This ocean front house foundation has stabilizing pilings below grade with a reinforced concrete block ground level area for parking and storage. Flood vents allow flood water to freely flow in and out without impacting the structure’s integrity. Topsider’s unique pedestal foundation is an attractive alternative to pilings and stilts for some coastal and ocean front settings. Easily built on a small footprint, it is naturally structurally resistant to hurricanes. 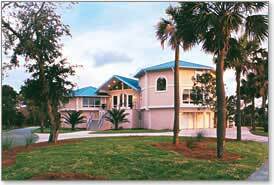 Some coastal and beach front locations require living areas to be elevated 20-ft or more above ground like this multi-level Florida Gulf Coast hurricane home, built on poured concrete pilings anchored on top of below-grade stabilizing pilings (or caissons). nearly 360 degree panoramic views from both levels. In some areas it is common to install below-the-surface pilings, cap them at ground level and build reinforced poured or concrete block piers to support the structure above. 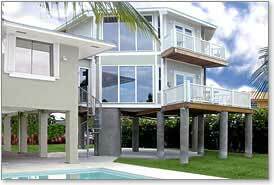 Virtually any Topsider Home design can be constructed on piling or stilt foundations. But, what often makes Topsider Homes the ideal choice is that each home is custom-designed to meet the needs of clients, their budgets, building sites and local building code requirements. 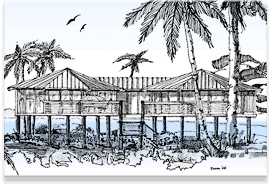 One-story piling (stilt) house designs ranging in size from small house plan ideas for narrow beach front lots to large primary homes where elevation is required. 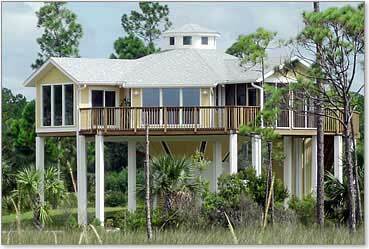 Two-story piling (stilt) house plan ideas for large luxury homes or small vacation homes. All of these home designs provide panoramic views from two levels. 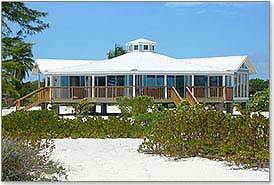 Built on short piers (stilts), this pre-engineered and prefabricated hurricane proof house was quickly and easily assembled in its remote location in the Bahamas. Click HERE to view video. Topsider's in-house design and technical staffs custom design each home and take the technical lead for permitting and approvals while our construction liaison department recruits potential builders and receives bids for local assembly and finish construction. Call us Toll Free at (800) 941-9801 [outside the U.S., call (336) 766-9300] for a No-Obligation, FREE Cost Estimate of any of our online house plans built on pilings or stilts. Topsider Homes withstood Hurricane Sandy and many other major hurricanes since 1968. Topsider's stilt homes are designed to withstand high winds, storm surge and salt-air coastal climates. were designed to be elevated on stilts and pedestals. 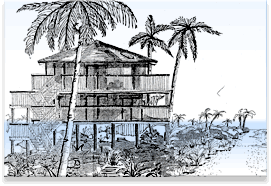 It’s our specialty, with innumerable coastal homes that have withstood the test of time from coastal Maine to the New Jersey shore and south through the Carolinas to the Florida Keys.